Quick and easy to knock up and transform lamb mince into something absolutely delicious. 1. Soak 8 wooden skewers in just-boiled water. Mix the lamb mince with the spices and 2 crushed garlic cloves. Season and fry a small amount of the mixture in a pan to check the flavour. Set aside in the fridge to chill and firm up. 2. Meanwhile, make the dip by mixing the soft cheese, oil, chopped mint, remaining crushed garlic clove and the lemon zest and juice. Season and stir in the salad onions; set aside while you prepare the koftas. 3. Divide the spiced mince mixture into 8 and shape each into a sausage around a wooden skewer. 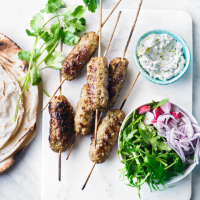 Set a griddle pan over a high heat and cook the koftas for 8-10 minutes, turning regularly, until cooked through. Serve with the coriander and cream cheese dip, plus a mixed salad and flatbread, if liked.